Results from astronomical observations accumulated in the last decades provide overwhelming evidence for the existence of a large amount of dark matter in the Universe. The majority of the mass in our universe is composed of non-luminous, non-baryonic matter. Despite dark matter’s dominance, its nature remains unknown. To directly detect dark matter and identify its nature is one of the greatest goals in modern physics. 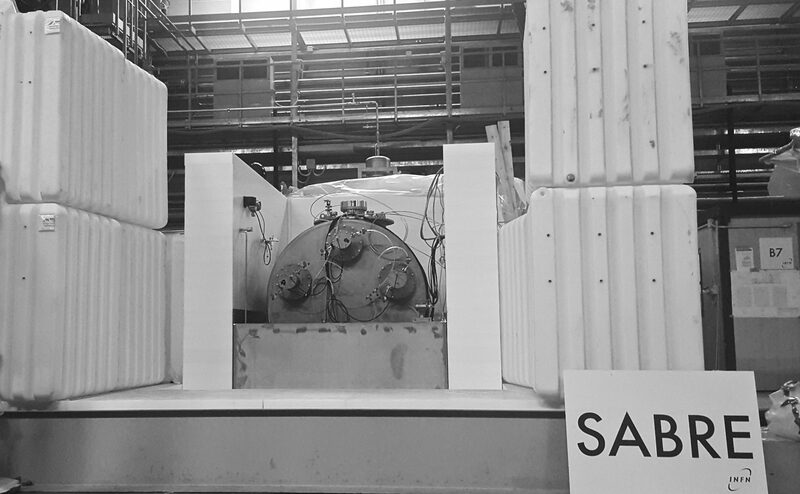 SABRE (Sodium Iodide with Active Background Rejection Experiment) aims at the direct detection of dark matter particles via their scattering off nuclei. A fundamental model-independent signature for dark matter particles interacting on a ground-based detector is the annual modulation of the expected interaction rate. Such modulation is due to the change of the Earth’s velocity relative to the galactic halo reference frame, with maximum interaction rate around June 2nd. SABRE aims to detect the annual modulation by an array of high radio-purity thallium-doped sodium iodide (NaI(Tl)) scintillating crystals deployed in a liquid scintillator, which works as an active anti-coincidence veto. The crystal radio-purity is a fundamental feature in SABRE. Therefore, a proof-of-principle measurement is planned to characterize the first 5 kg high purity crystals produced by the Collaboration. In addition, SABRE scientific program includes the deployment of two similar detectors: one in the Northern hemisphere at Laboratori Nazionali del Gran Sasso (LNGS), in Italy, and one in the Southern hemisphere at the Stawell Underground Physics Laboratory (SUPL), in Australia. This double measurement will improve disentangling any subtle effect due to cosmic muons, which have an opposite seasonal modulation in the two hemispheres.